NY Dem. Sen. Kirsten Gillibrand says she's thinking about running for president. New York Democratic Sen. Kirsten Gillibrand, re-elected just last week, now says she's considering running for president in 2020 in the wake of "corruption" within the Trump administration. “I’m obviously very dedicated to serving New Yorkers,” Gillibrand said on ABC's "The View." Gillibrand, in the Oct. 25 New York Senate debate, denied that she would run for president, saying, "I will serve my full term." Her then-opponent Chele Farley responded, "Honestly, I don't believe that, considering this is the third day she's been in New York in the entire month," she said. "When she's been in five other states, including New Hampshire in this month," ABC News affiliate WABC reported. Now she seems to have changed her mind: Gillibrand said a 2020 presidential bid may be another opportunity for her to counter Trump, despite the fact that her new six-year term extends until 2024. Is Sen. Kirsten Gillibrand going to run for president? “You’ve never seen, in my opinion, an administration that has more corruption than this one. The balance of powers-- this president has been trying to subvert it and undermine it every chance he gets. He’s put so much hatred and division into this world, into this country,” she continued. 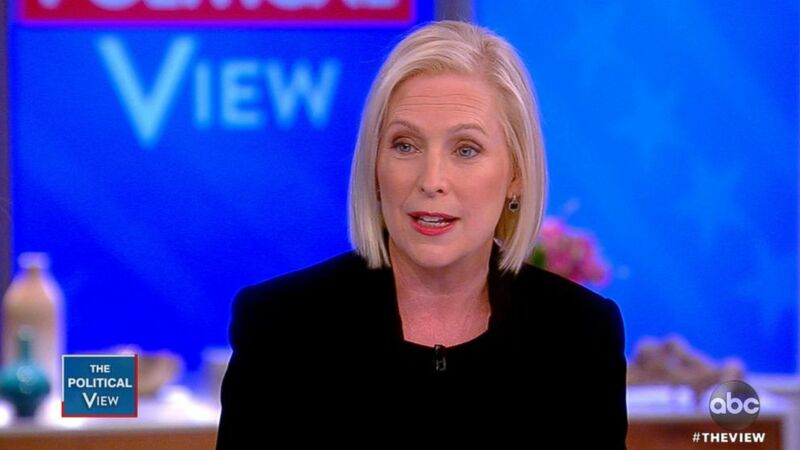 (ABC News) Kirsten Gillibrand appears on "The View," Nov. 12, 2018. “The fact that he has been on the record calling the Mueller investigation a witch hunt and a sham shows that he is biased and should not have that role today," she said. She called on Congress to protect special counsel Robert Mueller’s investigation into Russia’s possible involvement with the 2016 election. “We need that transparency and accountability by the Mueller investigation. And so what needs to happen the day we get back into Congress-- which is tomorrow-- we need to pass a law that protects that investigation. There is a bipartisan bill waiting to be voted on in the Senate today that would make sure that the investigation is protected,” Gillibrand said. She said the new Congress needs to work toward mending its relationship with Americans and renewing their trust in their elected representatives. Congress’ approval rating at the beginning of October was 21 percent, according to Gallup, which is even higher than it has been historically. “You need to restore our democracy to our founding principles. Every vote counts, which is why we are having recounts all over the country right now,” she continued. Gillibrand served on the U.S. House of Representatives from 2007 to 2009 and was first appointed to the U.S. Senate in 2009 when then-Sen. Hillary Clinton was nominated for secretary of state. She won her re-election bid against Republican Chele Farley on Tuesday with about two-thirds of the vote. Gillibrand has more than $10 million in reserve after her re-election campaign, according to OpenSecrets, which could set her up well for kickstarting a presidential run.